BRANDON, MB – A new report by Manitoba’s premiere rural studies organization outlines the need for immediate industry and government action in the province’s food and beverage processing industry, to support continued growth in sales, investments and jobs in the next few years. 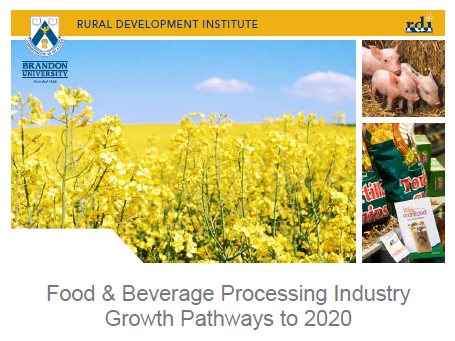 Today, the Rural Development Institute (RDI at Brandon University (BU) released Food & Beverage Processing Industry – Growth Pathways to 2020, an expansive look at a major economic driver in Manitoba. Food and beverage processing accounts for 28% of all manufacturing revenue in the province and 15% of all exports, employing 12,000 people or one in every four in the manufacturing sector. In contrast, Dr. Ashton says a “business as usual” approach is projected to lead to less-than-optimal production in pork and potatoes, which already face market challenges, pushing the food and beverage processing industry into a $100 million decline. The RDI report examines major sectors including pork, potatoes, and canola, plus the other players in the province’s food and beverage processing industry including meat, fruit and vegetables, dairy, grains and beverages. A sales profile of the industry was compiled using data from Statistics Canada and interviews with industry opinion leaders, which also helped establish trends to 2020. “The RDI report suggests that government-industry collaboration can make a significant difference to the future of the industry. I am hopeful that this Brandon University report can serve as a catalyst for a bright future for the agri-food industry of the province,” says Dr. Gervan Fearon, BU Vice-President (Academic and Provost).